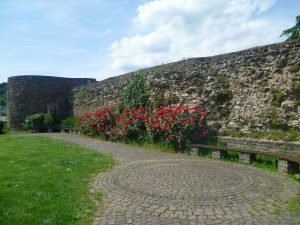 Boppard Roman Walls – plus dragon? Boppard is an attractive German town on the Rhine with an interesting Roman history. In the 1st – 3rd centuries A.D., it was a small riverine trading settlement called Bodobrica. These were settled times, and the Roman Germania Superior frontier, the limes, fortified by stone watchtowers and a wall of sharpened oak stakes, was a long way to the east. By A.D. 335, things had changed. The invading Alemanni had pushed the Romans back to the Rhine and the limes were abandoned. Brodobrica was now an important frontier town, occupying a strategic position. It became a substantial fortress with twenty-eight semi-circular towers and a 300m by 150m stone wall. 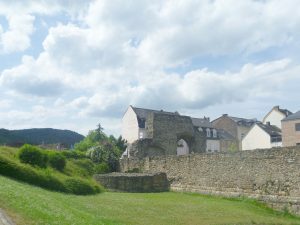 Fortunately for posterity, the mediaeval town kept the Roman walls until well into the 12th century, so a lot of it still survives. This pointed arch gateway is evidence of alteration in mediaeval times. Notice the Calvary on the wall to the right, perhaps indicating a subsequent Christian role for the building. Nowadays, it’s all part of an Archaeological Park with free public access. From this vantage point, you can see the arched doorway over the Roman wall from the other side. There are the remains of another semi-circular tower, centre left. I like the way the site is looked-after; the grass is cut, the roses tended, the hedges trimmed and the walls kept in good condition. I get the impression that Boppard is proud of its Roman remains. I was happy with the way this photo turned out! (It doesn’t always happen.) There’s a lot going on. On the left, there’s the Roman wall with a semi-circular tower and you can see how substantial it is. 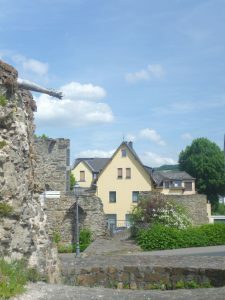 I like the attractive houses on the right, especially the strawberry-pink house with the Dutch gable; the ochre house, too is a fine example of Boppard vernacular housing. In the right foreground are some 7th -8th century Frankish Christian graves. Over forty wealthy graves have been excavated, and these three were left in situ. They have glass lids so that you can see paintings of the occupants and their grave goods – unfortunately, the lids needed cleaning and it was difficult to see much. However, taking a photo of the wall and the ochre house from a different direction, I noticed something very peculiar. Look at the projection on the top of the wall. What on earth is it? I took a close up photo and you can see for yourself; it’s certainly not Roman or mediaeval. It’s definitely modern and it’s either a dragon, or possibly a serpent (I felt sure it wasn’t a mere snake). Who put it there and why? I asked our Guide and he didn’t know. Well, he’s a Roman and Mediaeval specialist, so, quite reasonably, it’s of little interest to him, but I am a novelist. If I see something which plainly has a story, I want to know what it is. 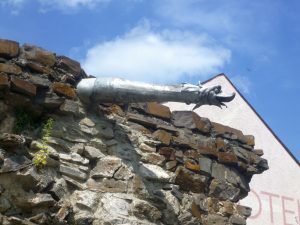 When I googled Boppard Roman Walls dragon, there was a lot about the walls (I was delighted to see that Boppard’s Roman Walls have many fans) but absolutely nothing about the dragon (or serpent). I’m rather hoping that someone reading this will know the answer. 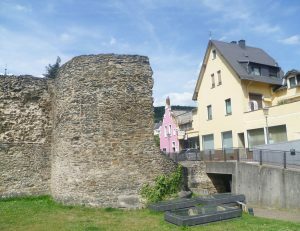 6 Responses to Boppard Roman Walls – plus dragon? You are so right, Elizabeth! I’ll let you know. The breadth of your interests is much appreciated. I’m far off on an island in the Pacific Northwest but your writing re-sparks memories and thoughtful pursuits. Thank you, Rachel. I’m delighted that you enjoyed the post. How fascinating this is. I loved seeing the Roman remains so well preserved, and with the delightful town houses fitting in so well. I eagerly await a comment from somebody who knows about the Dragon! And I would love to know more about the Frankish Christian graves with their glass lids. I didn’t know about them before. Thank you for your comment, Eleanor. I, too, enjoyed the juxtaposition of the attractive town houses with the impressive Roman wall. The Frankish Christian graves didn’t originally have glass lids, of course; the modern paintings underneath allow the visitors to get an impression of what was once there. Unfortunately, as I said, they needed a good clean. 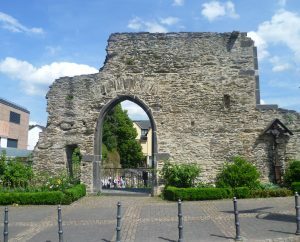 What they lack is ‘Friends of Boppard Roman Archaeological Park’ to tidy them up! But maybe they don’t do that in Germany.